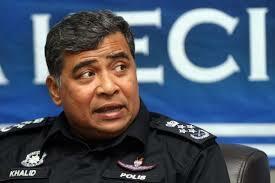 Malaysia’s Inspector-General of Police, Khalid Abu Bakar, is in a class of his own. Instead of upholding and defending the constitutional rights of citizens to debate and discuss the place of Sharia law in a multicultural nation like Malaysia, he urges acceptance and acquiescence of Sharia on the grounds that questioning it might provoke a terrorist attack! If that is true, then the terrorists have won without a fight, and Malaysia might as well be declared part of al-Baghdadi’s Islamic State of Iraq and the Levant. With an IGP like that, no wonder Malaysia is in trouble. Inspector General of Police Tan Sri Khalid Abu Bakar warns Malaysians not to question Islam and hudud as it could provoke a retaliation from the Isis militants. – The Malaysian Insider pic, March 24, 2015.Inspector-General of Police Tan Sri Khalid Abu Bakar has warned Malaysians not to question Islam and hudud as it could provoke a retaliation from the Isis militants. The Star online reported that Khalid said police surveillance and intelligence revealed that the group was planning an attack and the police were doing all it could to minimise the danger. “We know what the group is capable of and its objectives. The public is advised not to simply comment on these sensitive issues as it invites a reaction from them,” the report quoted Khalid as saying at a press conference today. “By openly discussing sensitive issues like Islam and hudud, it will make them sympathise. Hence, there will be a retaliation if we are not careful. The top cop was also quoted by the Malaysiakini news portal as saying he did not rule out the possibility of a Paris-style terror attack happening in Malaysia due to comments on hudud. The portal quoted him as saying such an attack could be done by locals who have been “poisoned or brainwashed” by Isis, or by foreign militants who had slipped into the country. Khalid’s warning comes after human rights lawyer and Lawyers for Liberty chief executive Eric Paulsen was picked up after he had made critical comments on hudud on Twitter. The IGP had earlier warned that police will investigate anyone who made comments on sensitive religious matters, but had no expertise on the subject. The police are also investigating the producers of business radio station BFM89.9 and presenter Aisyah Tajuddin for blasphemy, after the station aired a video allegedly questioning the implementation of hudud in Kelantan. Isis has proven attractive to some Malaysians and early this month Special Branch’s Counter-Terrorism Division (SB-CTD) principal assistant director Senior Assistant Commissioner Datuk Ayob Khan Mydin Pitchay had said 61 Malaysian nationals were detected to be in Syria with Isis. Ayob Khan said so far at least 500 Facebook accounts have been identified as carrying out activities to promote, recruit and encourage Malaysians to fight in Syria. – March 24, 2015.